Bridgeport, CT – (May 26, 2018) – Lamboginny, Nigerian recording artist and prison reformer, is slated to perform for the first time in the United States, as the headliner for a benefit concert in Weston, CT.
Jeff Grant, Executive Director of Bridgeport-based Family ReEntry, a leading nonprofit supporting families impacted by the criminal justice system, explained, “Family ReEntry is overjoyed to serve as Connecticut partner for this benefit concert. Lamboginny, and his Nigerian youth criminal justice nonprofit SALT, offers an international viewpoint of what Family ReEntry is advocating in the U.S. The message for this concert is to raise awareness for the incarcerated youths and recently released young adults who are striving to transform their lives and make positive changes for themselves, their families, communities, and in this case, the world.” Scheduled to speak at the event is Fred Hodges, Family ReEntry’s Director of Community Affairs. Lamboginny is the Nigeria-born singer, whose music is rooted in a Jamaican Reggae style and integrated with elements of West African music known as Afrobeat. His music is a popular radio-friendly style that contains inspirational and memorable sing-along choruses and thought-provoking lyrics. Lamboginny’s music has a crossover appeal to multiple age ranges as evidenced by the double performance showcase in Weston on June 9th. Lamboginny will have an early performance at the Norfield Congregational Church (64 Norfield Road, Weston) from 11:30-1pm for Children & Seniors, followed by an all ages evening concert from 7pm to 9pm. An eight-piece band from Bridgeport will accompany Lamboginny. The free admission concert asks that attendees can volunteering consider donating funds that will go toward supporting imprisoned Nigerian youths. Lamboginny specifically sited that there was a desperate need to construct and stock libraries in Nigerian youth prisons. Recently, Lamboginny’s rising popularity was the topic of international news when he was featured on CNN and the BBC. 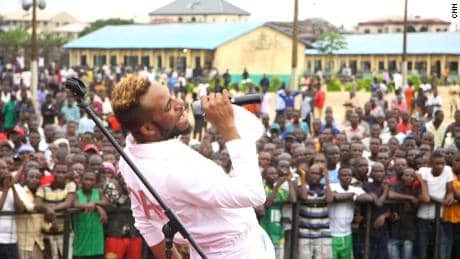 (https://www.cnn.com/2017/12/20/africa/passionate-singer-hope-nigerian-prisoners/index.html). Born Yinka Lawanson in the mid-80s, Lamboginny grew up in Lagos, Nigeria. In his early twenties, Lamboginny was inspired by artists like the late Bob Marley and Afrobeat music creator “Fela Anikulapo Kuti” who used their voices and music for more than entertainment. An opportunity to serve arrived in October 15, 2009 when a friend paved the way for Lamboginny’s first prison concert. “Prisons permit pastors and teachers to minister to the inmates, but what about musicians? When I saw their hope after hearing my music, I knew then that I’d found my purpose,” Lamboginny said. To date, Lamboginny has performed more than a dozen prison concerts and has arranged for the release of 120 young Africans. With funds that he raises through his performances and record sales, he works to reintegrate released inmates into society, to find them jobs, and to provide vocational workshops to juvenile offenders still in prison. Family ReEntry is a 501c3 nonprofit, which was founded in 1984 as a reentry support group for men at the Isaiah House in Bridgeport. It has since grown to include policy advocacy, and intervention, prevention, in-prison, reentry, fatherhood and youth & family programs. Over the past 34 years, effective advocacy efforts and community-based programs developed by Family ReEntry have significantly reduced the likelihood that clients will re-offend, be re-arrested, or be re-incarcerated. Its programs provide a spectrum of services designed to disrupt the intergenerational cycle of incarceration. Family ReEntry addresses the specific needs of each client and their families through individualized case management and support services. It works to create a positive social network for each client, helping make their transition from prison back into the community a successful, self-sufficient one, while strengthening their families and the community. Family ReEntry has offices in eight Connecticut cities: Bridgeport, Norwalk, New Haven, Waterbury, Derby, New London and Norwich. More information is available at www.familyreentry.org and on its social media including, Facebook, Twitter, Pinterest, Instagram and YouTube.